Paw Print Genetics - Muffin Tin, Muffin Tin, oh where did I put my Muffin Tin? As her veterinarian collects each sample, Carol carefully deposits each sample into the labeled liner corresponding to the correct puppy. To prevent DNA contamination between puppies, she requests that the veterinarian clean the tools and change gloves before collecting the sample on the next pup. This is repeated until the samples from all puppies have been collected. When the veterinarian has finished with each puppy, Carol puts a clean paper towel on top of the muffin tin containing the samples and tapes it down tight, so that no foreign bodies get on or in the samples. When Carol gets home, she places the muffin tin on top of the refrigerator where they can safely dry. Once these samples have dried for about a week, they are ready for shipment to Paw Print Genetics. Since only one dewclaw, ¼ of a docked tail, or ½ inch of the umbilical cord (from the side still attached to the placenta) are needed for genetic testing, prior to sending in the samples, Carol creates a second paper liner for each dog (with puppy name and ID number) and transfers the samples to be retained for each puppy to the second liner in case another sample is needed. Each liner containing either the sample for testing or the sample for storage is then placed in its own clean zip-lock bag. The air is removed from each bag prior to closure. Given the importance of each DNA sample, we recommend purchasing tracking information on any package sent to PPG and sharing this information with us via phone call or email, so we can add it to the order in case we need to track the sample to the laboratory. We are happy to investigate shipping problems, such as lost packages, when requested by our clients. Once the samples are received in the laboratory, an email notification is sent to notify the client of its arrival. It is at this time when our 14-day turnaround time starts for samples undergoing disease, coat color, or trait testing. Though most profiling or parentage testing is also completed within 14 days, results for these orders may occasionally take up to 3 to 4 weeks. Once your testing is completed and reviewed by our laboratory and medical directors, results are posted to your secure Paw Print Genetics account and we will notify you via email that they are available for download. 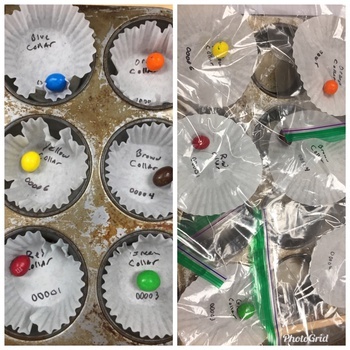 I hope that you find the muffin tin technique helpful for organizing your drying DNA samples. If you have any questions about this technique or have any other canine genetic testing questions, please feel free to contact the Paw Print Genetics Laboratory at AskUs@pawprintgenetics.com or give us a call during regular business hours at 509-483-5950 (Mon. to Fri.; 8 am to 5 pm PST) to speak to our helpful and knowledgeable staff. And if you have any helpful ideas to share, please let us know for a future blog. Note: These guidelines are intended for those who desire early genetic testing on their puppies using otherwise discarded dewclaws, docked tails, or umbilical cords. This is not a guide on how or when to remove dew claws or dock tails and expert veterinary advice should be sought outside of this document to address these concerns.